The Word of God describes the Christian life as walking the narrow way, rather than choosing the wide gate that leads to destruction. Choosing this narrow path only happens with great intention. It is not a one-time decision, although there is often a decisive moment when the idea of pursuing a relationship with the God of the Universe begins to take root in your heart and mind, such as when the fishermen left their nets to go with Jesus as his apostles. Although the decision be made, much like marriage, the continual pursuit towards the end goal is made up of a million daily moments of choosing. Will I love God today? Will I choose to chase down this covenant? This relationship? Will I make this a priority above other pursuits? No successful, thriving, and long-term marriage is made by one moment at an altar, whilst wearing a beautiful white gown and enjoying a magical day. Rather, an "enviable" marriage is made up of moment-by-moment decisions to choose the commitment made rather than the fleeting feelings. It's deciding to continue on the path when it gets dark and difficult and even treacherous. Likewise, a life well lived for the glory of God consists of day-by-day, or even minute-by-minute, choices to press on. To just keep on the journey. Yes, a Christian's walk may have been born in a distinct moment when the decision was made and marked by a prayer. But a flourishing and God-honoring life, lived for the glory of God, is ever mindful of setting your gaze on the unseen kingdom. No "giant of faith" such as Billy Graham or Charles Spurgeon would say that they served God well because one day they made one choice and that was that. If we were to investigate their daily lives, we would find rhythms and habits that directed these faithful toward that narrow path. We would find a million little ways that they stood at a fork in the road and made a decision to keep going. A day when despite oversleeping, they chose to take a few moments to refocus their day in the Word and through prayer. A moment when they faced a temptation, but deferred instant gratification for the exchange of an eternal reward instead. A difficult relationship where they chose to take a deep breath, utter a quick prayer, and either choose silence or grace. A stressful day when they had many emotions fueling them, but ran to God to help them. In moments desiring affirmation, seeking it from the Word of God rather than the lips of men. When trials and confusion clouded the path, telling their soul to choose to trust the unseen rather than the seen. Oh, yes. The Christian life is not about one-time decisions. And there's no "feel-good, only success and blessings" guarantee. In fact, quite the opposite. As Jesus assured his disciples that in this world, they would have tribulation. That's a promise he told them to bank on. Not quite the way I might build a following. But Jesus knew. Jesus lived here on earth, fully man, and his life pointed the way for how to live for the invisible. He shows us again and again and again that the road to God is unexpected and difficult. It is contrary to our natural tendencies and gut-reactions. The truth is that the road to God is not crowded, and even more so the deeper you go with him and the higher you climb toward him. However, the loneliness from the void of fellowship with others can point us toward the fulfilling presence of God. The deep convictions and strong feelings of the Psalmist, after all, were born from long and lonely days abiding with his God on the hillside, as a lowly shepherd. The road to God is not about a healthy self-esteem, but rather about a healthy God-esteem. The road to God is more concerned about sanctification than it is about success. It's focus is on learning to think truer thoughts of God, learning to form an identity based on the gospel, and finding the marking of spiritual growth through our ability to love others in increasing measure. The road to God chooses to throw off all that is self-serving in order to be more God-serving. The road to God reminds us that the priority is how we feel and what we believe about God -- NOT how we feel and what we believe about ourselves or others. The road to God reveals the glory of God in increasing measure. As his glory is seen more clearly, the road to God reveals all the ways we tend to steal his glory for our own. These revelations convict us to stop being such a thief. The road to God stirs an increasing awe for the gospel story and a decreasing draw to the things of earth. The road to God highlights in increasing measure how unworthy and wretched our sinful selves are and how gloriously rich in grace is the love of our Father. The road to God hangs all its hope on the truth that the glory in the eternal is incomparable and far outweighs the suffering on this earth. The road to God tells us to choose to offer a sacrifice of praise and thanksgiving when our hearts least feel this inclination, as this is what our hearts most need in those moments in order to reset our focus on the unseen glory to come. The road to God is not marked with mile markers of performance and achievements and legalistic practice. It's marked instead by hearts that fall harder and harder on the grace of God that can never be earned. The road to God is keenly aware of how broken we all are, how desperately we all need grace, and thus grows in a willingness to extend it to others. The road to God has no room for criticism of others, for it is far too busy dealing with the planks in our own eyes. The road to God is not about material possessions or the approval of man. Instead, it is growing in a love and adoration and gratitude of the One who came to make us his own. The road to God is marked by those who set their minds on the day they will look their Father in the eye. Imagining that day reminds them to throw all their time, energy, and gifts to the Kingdom of God. The road to God is marked with an increasing motivation and drive to finish empty. These are all things that my mama didn't tell me about the Christian life. Or if I were ever told, I didn't listen well. But these are all the things that are being revealed in increasing clarity as I actually study and read through the entire Bible with more intention than I ever have. I've gone from reading books about the Bible to just actually reading the Bible. In so doing, I'm gaining an increasing appetite for the meat of the Word rather than the milk. And in this glorious endeavor, I am finding freedom. I am finding that the more I partake of the goodness and glory of God, the hungrier I am for it. The more I grasp the grace of God, the more in awe of it I am. The more I choose to walk this road, which seems ever more narrow and lonelier the higher I go, the more I want to never settle for anything less. And, the more I wish I had seen it all for what it really is much sooner than in my 40's. I grow in regret for the years I built a faith that was erroneously propped up on self-righteousness. This road is not easy. This road is never quite what I expect of it, even when I seek to anticipate what lies ahead. 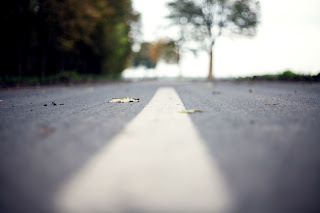 This road reveals my own humanity in increasing measure, and my desperate need for a Savior. Yet there is no other road for me. I declare with every ounce of my being that I will not turn from this road. I may fall and stumble and stop along the way. I may crawl on hands and knees, in my own failings and shortcomings. I may get distracted from time to time. But this is the only road for me. For despite the uncomfortable dissatisfaction with this world that this road reveals within me, it summons me to travel on, committing more of myself to the journey, fully convinced that there is no better road. There is no other road worthy of my efforts.